The HEPA Kit converts the Velo and Velo Pro airmovers to be used for general air scrubbing applications. Installs in a minute or less – no tools needed. 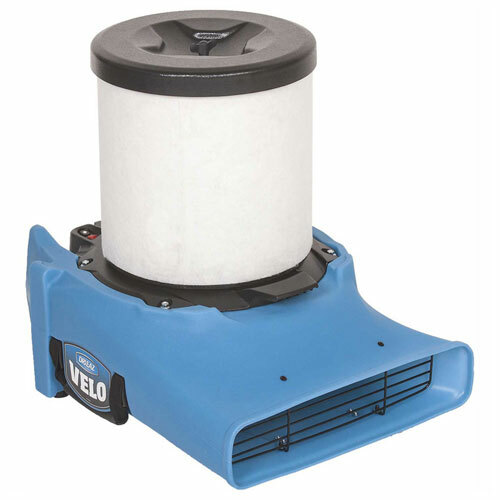 Use your Velos and Velo Pros wherever you need professional indoor air quality control. Prefilter cover extends life of HEPA filter - 1 included, 20-pack refills (F520) purchased separately. SPECIAL INSTRUCTIONS: When using your Velo or Velo Pro HEPA Kit for conditions where dangerous contaminants may be present, both the HEPA filter (F519) and the Prefilter (F520) should be replaced after each job to help prevent cross-contamination. Before installing new filters, vacuum and damp wipe top plate and wire frame according to current ANSI/IICRC standards for remediation. Remove filters and clean unit before removing it from the containment area to avoid cross-contamination. Allow the unit to dry before installing clean filters.